Dr. M. Premjit Singh (b. 1955), Vice-Chancellor, Central Agricultural University, Imphal passed his M.Sc. (Life Sciences) in 1981 from Jawaharlal Nehru University, New Delhi and stood first position for the Centre of P.G. Studies, Imphal. He obtained his M.Phil and Ph.D. Degree in Zoology from Himachal Pradesh University, Shimla. Dr. Singh started his service career in erstwhile Manipur Agricultural College, Imphal as Assistant Professor (Entomology) in 1986 and became Associate Professor in 1990, Professor in 1998 and Director of Extension Education on 2009 in Central Agricultural University, Imphal. 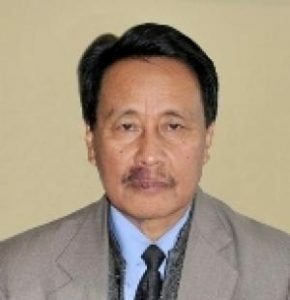 Besides professional positions, he acted as Registrar, Deputy Registrar (Academic), Assistant Registrar (Academic) and Research Coordinator (Oilseed crops) in Central Agricultural University, Imphal for more than a decade. The Young Scientist award was conferred to Dr. Singh in 1992 by DST, New Delhi for his research project entitled “Studies on bee pollination of oilseed crops”. Dr. Singh has undertaken six research projects funded by external agencies and supervised 5(five) Ph.D. and 10 (ten) M.Sc. (Ag.) theses. He attended 8 International Conferences, 77 National Conferences and 5 training courses. To his credit he has got 99 research papers, 55 research communications, 7 books, 11 technical bulletins and many popular articles. He is the Chief Editor of CAU Farm Magazine and CAU Kisan Diary published in 7 languages. He has vast experience in North East Agriculture and credited with memberships in a number of high level committees, Expert groups, Professional bodies, University bodies etc. Dr. Singh has developed/identified about 14 novel technologies/concepts/methodologies in the area of plant protection. Large scale demonstration on “Zero tillage cultivation of rapeseed-mustard in rice fallow “covering more than 1000 ha for 4 consecutive years; front line demonstration on location specific IPM in rice using gall midge and blast resistant rice variety in 200 ha for 5 consecutive years, construction of water harvesting structures in Farmers’ field with microirrigation facilities and quality seed production of rice and oilseeds under seed village concept are some of the exemplary contributions of Dr. Singh for the resource poor farmers of North-Eastern Hill Region.